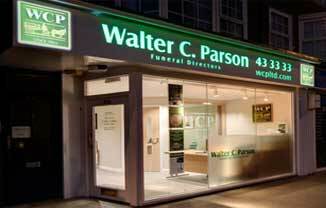 Walter C. Parson Funeral Directors is a family business established in 1842 at Stoke Climsland, Cornwall. It has, either by inheritance or acquisition, remained in the family over seven generations. This in turn has enabled a small family owned funeral director to grow into a group serving the South West Peninsula, covering Plymouth at St Judes, Crownhill and Plympton; Ivybridge, Tavistock, Callington, Torpoint, Saltash, Newton Abbot, Torquay and Exeter. We pride ourselves that the service we provide will be personal, professional and respectful in every way, from your first contact with us to the final resting place of your loved one. All of our funeral directors hold a recognised qualification in funeral directing. We offer a varied range of funeral packages, from the basic to the bespoke. We are also able to offer a unique and personally designed Order of Service sheet and you may wish to consider our “Reflections” DVD service, which captures the special memories of your loved ones’ life during the funeral service. Making contact with us is the first important step for all concerned. Contact details of the local register offices and the information they require. Decisions for the type of funeral, date and location and how to remember a loved one. Choosing the right person to take the service, conduct the funeral and guide you through the arrangements. Concluding the finer details in preparation of the service. A guide to the various cost implications, including flowers, newspapers, donations and much more. With our thorough local knowledge and our associations with many professional organisations, we consider ourselves to be one of the UK’s premier funeral service providers. This means we are well placed to help you, should you need us to. Our award winning pre-paid funeral plans are selected to offer choice and versatility to suit your needs, but we can also tailor ‘bespoke’ funerals if you have other ideas. Our pricing is completely transparent, with our full price guide available by selecting the link below. The cost of a funeral will always be explained fully to you, either over the telephone if you choose to phone us for a quote, or by your funeral director when making the funeral arrangements. We look forward to helping you in the future, in the meantime, if you have any questions you would like answered, please feel free to give us a ring. Our funeral plans with clear and precise information. The cost of a funeral explained, including our current price guide.